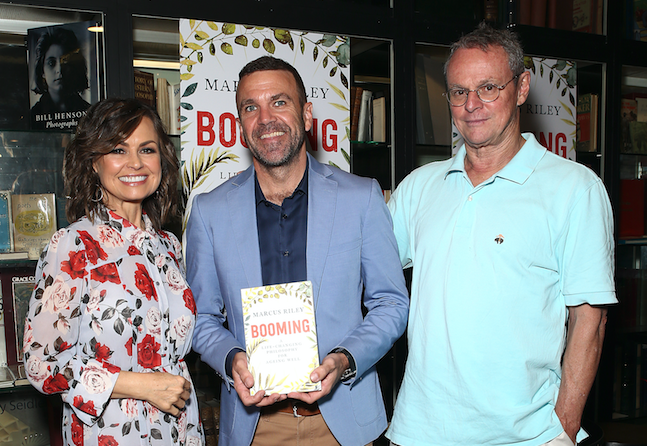 Journalist and television presenter Lisa Wilkinson, hosted a book launch to celebrate the official launch of positive ageing advocate Marcus Riley’s book, Booming: A life-changing philosophy for ageing well. Fittingly held at Berkleouw Books in Sydney’s Paddington, Lisa welcomed guests and highlighted the need to approach the second half of life with gratitude and joy. “As we get older, we want to be challenged and to feel like we are continuing to grow. When we look at previous generations, when I look at my mum’s life, when she was the age that I am now, I think of a really, sadly, a very closed in life. As more and more of us realise what is possible in our later years it is something that you embrace with incredible joy and enormous gratitude. And the good news is, the truth is, we are all ageing! That’s good news, right? Everybody’s ageing at exactly the same rate,” said Lisa. Lisa stressed the importance of having good role models to look up to that are living life as Marcus’ book encapsulates, that is, living their extended years with joy, passion and purpose. Booming is the result of Marcus’ 20-plus years’ experience in the ageing industry, he advocates that by embracing positivity, planning how you want to live the rest of your life and understanding the need for purpose, we can all age successfully. “My book is the result of my many years involvement in the world of ageing and I believe, that when it comes to ageing, people have a choice. People can accept the negativity that abounds about getting older, concede that they will decline and wither on the vine. Or we can choose to seize the opportunity to revel in our extended later years with joy, passion and wisdom,” said Riley. ‘I hope that my book encourages people to do just that and engage in healthy ageing,” he added. Riley’s novel sheds light on the challenges and delights (too many to mention!) of being an older person, and in doing so, helps provide a blueprint for successful ageing. From an early age, Riley has always had a passion for older people and an interest in aged services. Riley studied business management and has worked in the aged-care industry for the past two decades, providing leadership and influence on local, national and global levels. Riley is the immediate past chair and current Director of the Global Ageing Network and a member of the Steering Committee for the Global Alliance for the Rights of Older People (GAROP). He is also the Focal Point for the Stakeholder Group on Ageing (an agency of the United Nations) for the Asia-Pacific region. Riley is Chief Executive Officer of BallyCara, a charitable organisation and public benevolent institution which provides accommodation, health, and care services for older people as well as a range of support and advisory functions to service-based industries. Booming: A Life Changing Philosophy for Ageing Well (RRP $32.99) is available now at Dymocks, Harry Hartog, Booktopia, Book Depository and all other good bookstores. MyFiziq Limited (ASX:MYQ) (MyFiziq) is pleased to announce its first strategic partnership in North America with one of the world’s leading fitness applications (app), Fitocracy. Based in New York, Fitocracy was founded in 2011 and is considered a pioneer of mobile/digital fitness. The platform has partnered with some of the top performance & fitness brands & experts over the years, including Arnold Schwarzenegger and Red Bull, and continues to be one of the top mobile apps at the forefront of improving consumer health & fitness. Fitocracy and MyFiziq will collaborate to offer MyFiziq’s revolutionary body shape tracking application to the Fitocracy community. Fitocracy’s current user base of over 2 million users will be able to track changes in their body shape and dimension using the MyFiziq technology as they follow Fitocracy’s coaching programs. MyFiziq will be an integral part of Fitocracy’s offering and a key point of difference to other platforms. With an initial target of 500,000 Fitocracy users subscribing to the MyFiziq solution, potential revenue to MyFiziq, excluding future Fitocracy growth, is up to US$9 million. Fitocracy is backed by leading venture capitalists, including renowned Silicon Valley and New York funds and human performance specialists with experience at NeV, UFC Gym and Nike. Fitocracy will also be launching new branded apps in partnership with top brands & athlete influencers, including Floyd Mayweather, which will also be integrated with the MyFiziq technology. Fitocracy is a leading fitness application that empowers & motivates consumers to reach their performance & fitness goals through community, coaching & gamification. Fitocracy is considered the pioneer of social fitness and is one of the longest-standing fitness mobile apps. Backed by leading venture capitalists and in partnership with top fitness brands & athlete influencers, Fitocracy provides fitness at every level, bridging consumers from wellness to fitness to high performance, regardless of age, skill, interests or background. MyFiziq Limited (ASX: MYQ) equips users with the tools to track their personal progress towards their goals over time, whether that’s fat loss, muscle gain, or maintaining their current physique. MyFiziq adds science to this art to create a holistic approach to measuring, tracking, and most importantly, seeing changes to your body shape over time. Body measurements provide more useful information about shape changes than simply measuring weight or BMI. But until now, body measurements have required a tape measure, creating a potential for error. MyFiziq removes this margin of human error to help users keep track as they smash through limits and achieve their goals.